Brief: When a leading sportswear brand and a legendary football club team up to launch club kits to kick off the 2014-15 football season, the event has to be spectacular. Puma introduced the much celebrated Arsenal Football Kits in a stunning 4 day event held in Bangalore’s iconic UB City. Puma created a unique ‘Arsenal Tunnel of Time’ as a tribute to the legendary club and showcased Arsenal memorabilia, trophies from the FA Club, the Invincible Trophy, special moments from Arsenal history and photographs of Arsenal legends. This event also saw a special appearance from the former Gunner, Freddie Ljungberg, who flew down especially for this mega event. 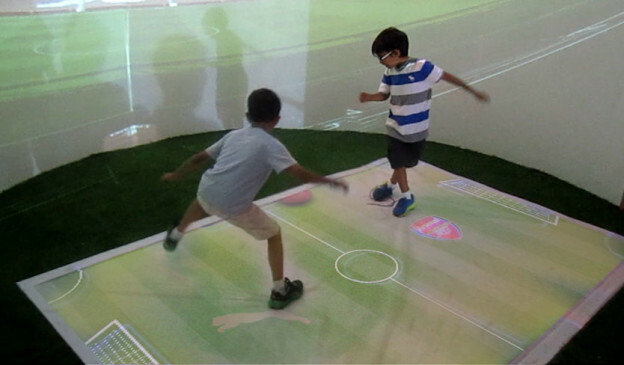 Puma employed the capabilities of TouchMagix’s interactive technology to create a special experience zone for the event visitors. 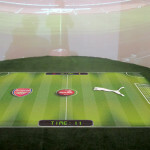 TouchMagix deployed an 8X6, specially customized, MotionMagix™ Interactive Floor with the Puma and Arsenal logos to reflect the brand identity. 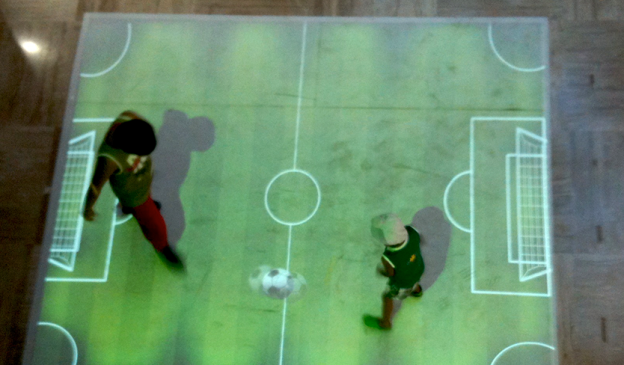 This floor was loaded with a number of interactive football games for the visitors to enjoy and test their football skills. The highly engaging format of the games and the interactive capabilities of the floor with single and multi-player options attracted the attention of many visitors and saw great participation. After all entertainment targeted at one of Arsenal’s largest fan bases in the world has to be legendary as the Club itself! 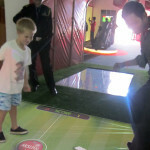 Impact: The MotionMagix™ Interactive Floor provided entertainment which was in tune with the high energy levels of the event and generated great participation from visitors while making a brand impact. This entry was posted in Consumer and Retail, Education and Kids, Event and Media, Retail, Sports and tagged arsenal, banglore, experience zone, Football, interactive floor, interactive floor projection system, Kids, Kids Entertainment, kids event, motionmagix, MotionMagix Floor, MotionMagix Interactive Floor, puma on August 28, 2014 by Touchmagix. Using MagixFone™ to engage a larger number of people from the audience and help in generating higher revenues. Objective: To use the capabilities of interactive technology for promotions and increased interactions. Come sport season and most food & beverage outlets gear up to come up with innovative ways to promote their outlet to generate footfalls and increase traffic. With the football season round the corner TouchMagix has come up with a unique package that restaurants and pubs can use to increase guest participation and offer them a lot more than just viewing the match as a part of their promotion strategy. Using the capabilities of the MagixFone™ the restaurant owners can incentivise footfalls at their venue by distributing goodies, discount coupons, vouchers etc. to guests who play the quiz while the game is played. 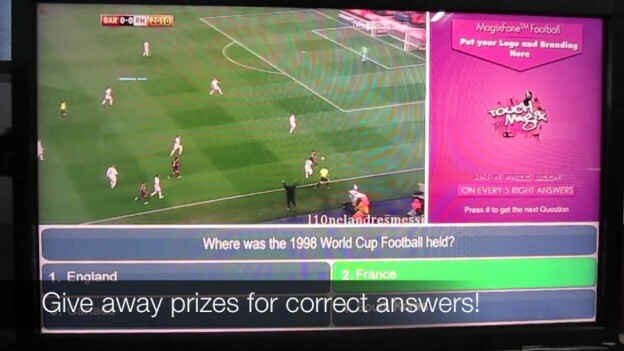 The quiz questions run on the same screen where the game will play and requires no additional displays. To participate the guests simply have to text their answer to the number flashing on the screen and the MagixFone™ sends the gift coupon through a text to the winner. The capabilities of the MagixFone™ allow multiple users to participate in the event at the same time and thus engages a much wider audience in an interactive manner which otherwise would be difficult to achieve. 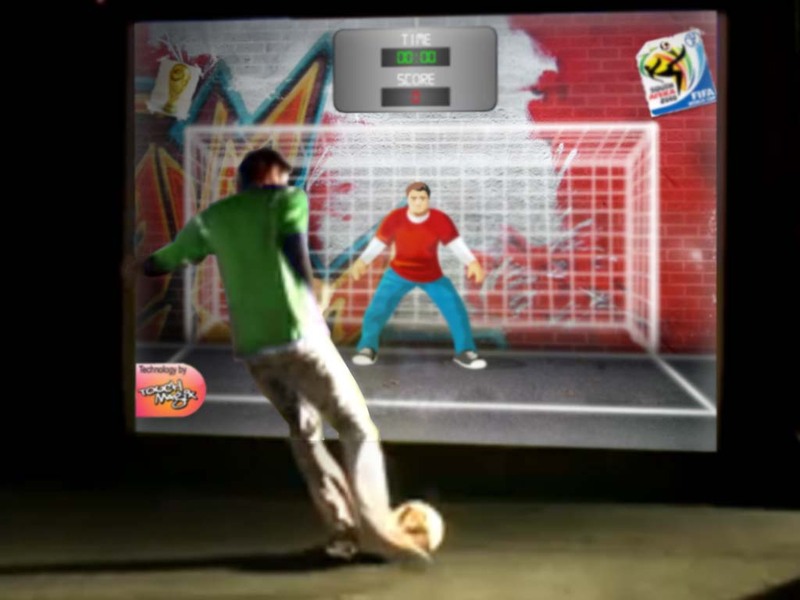 Impact: The interactive capabilities of the MagixFone™ can be used to engage a larger number of people from the audience and help in generating higher revenues. This entry was posted in Consumer and Retail, Event and Media, Hospitality, MagixTouch, Sports and tagged F&B, Football, MagixFone, Retail on May 22, 2014 by Touchmagix. 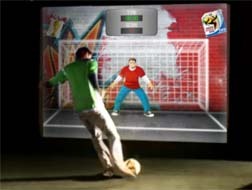 TouchMagix™ is offering new interactive floor, interactive wall football games. 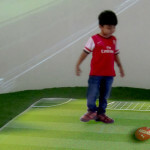 This entry was posted in MagixTouch, Sports and tagged Application, Football, Games, motionmagix on June 4, 2010 by Touchmagix.